In 788, about a century after the Arab conquest of North Africa, successive Moorish dynasties began to rule in Morocco. In the 16th century, the Sa'adi monarchy, particularly under Ahmad AL-MANSUR (1578-1603), repelled foreign invaders and inaugurated a golden age. In 1860, Spain occupied northern Morocco and ushered in a half century of trade rivalry among European powers that saw Morocco's sovereignty steadily erode; in 1912, the French imposed a protectorate over the country. A protracted independence struggle with France ended successfully in 1956. The internationalized city of Tangier and most Spanish possessions were turned over to the new country that same year. Morocco virtually annexed Western Sahara during the late 1970s, but final resolution on the status of the territory remains unresolved. Gradual political reforms in the 1990s resulted in the establishment of a bicameral legislature, which first met in 1997. Improvements in human rights have occurred and there is a largely free press. Despite the continuing reforms, ultimate authority remains in the hands of the monarch. Early Kingdom of Morocco gold coins were hammered Dinars and Benduqui (or Bonduqi), which had standard weights of 3.52 grams. Half and quarter gold dinars were also issued. These hammered coins persisted until the end of the reign of Mohammed IV in 1873. 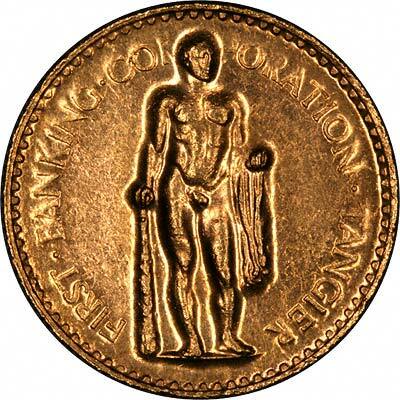 The next gold coinage issue was for Mohammed V in 1952, as a rare 50 Franc denomination. The First Banking Corporation issued a 500 Dirhams in 1954, which bears no date or denomination, for the Tangier International Zone, which existed from 1912 to Moroccan independence in 1956. 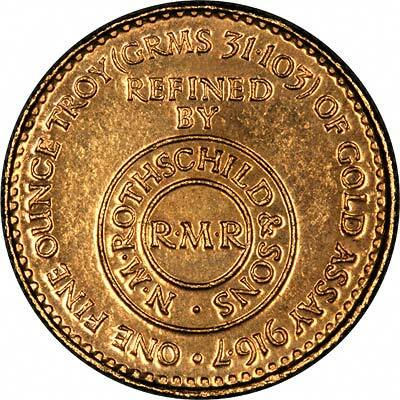 Although Krause states this to show no mint name, the reverse states it to be refined by Rothschild. This can be seen in our photographs. On the resumption of the Kingdom in 1962, further gold coins denominated in Dirhams were issued as a "reform" coinage, and there was a further coinage reform in 1999. We can find little information about the First Banking Corporation as evidenced on these unusual coins or bars. It is clear that they were issued in its name. These are shown in Krause's World Gold Coins as 500 Dirham coins, and we have no reason to doubt this status, but we have also listed these coins as One Ounce Rothschild First Banking Corporation Tangier Round Gold Bars. Naked, standing figure of Hercules, holding a robe over his left arm, and leaning on a club. R.M.R. (for Royal Mint Refinery) in its inner circle. The edge is miiled, and the coin is 4.25 mms thick. Technical specifications of the most frequently encountered Moroccan gold coins. For silver and base metal coins of Morocco, please look at our original Chard Coins website.